The Barn Door Bundle is SO on trend right now, I can hardly stand it! The card is very easy to make using the framelits. And by purchasing the stamp set and framelits together, you can save 10%! Cut a piece of Whisper White cardstock 5 ¼” x 4” and die-cut the track making sure to leave a little more room at the top than the bottom. Run it through the Big Shot again using the Stripes or Pinewood Planks Embossing Folder. Die-cut the hardware in one pass using Basic Black cardstock. 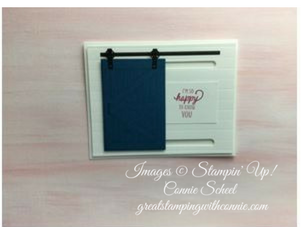 Stamp the door with Dapper Denim Classic Ink on a scrap piece of Dapper Denim cardstock, added the recessed handle stamp and diecut the door. Use Multipurpose Glue to add the hardware to the door, and to add the thin strip of hardware above the track. 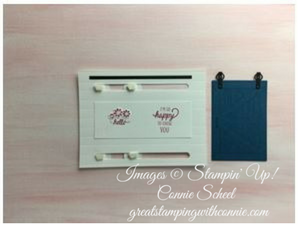 Stamp your greetings on a piece of Whisper White cut to 4” x 1 ½” and adhere to the centre of the striped panel. Punch four circles out of Whisper White cardstock with a ¾” Circle Punch. Use care to get the Dimensionals straight and not touching the side of the slot. You can’t see it in the photo, but the Dimensionals on the bottom of the stack are straight, it’s just the top one on each stack that looks crooked, where it doesn’t matter. Place the door on the Dimensionals, checking to make sure the cardstock circles do not show. Place Dimensionals on the back of the entire piece and adhere to the card base. This elevates the piece so the door slides freely. And there you have it, a working, sliding barn door!